Shifts of plant community composition with enhanced atmospheric nitrogen (N) deposition in grasslands have occurred globally. Despite extensive studies on the effects of enhanced N deposition on plant species composition of grassland community, few studies have focused on belowground ecological processes and duration of N addition. In situ long-term (14-year: 2004–2017) and short-term (4-year: 2014–2017) N-addition experiments in the same sites were conducted in a temperate steppe of northern China. We investigated the effects of N-addition on plant community composition and root traits by comparing results of short-term and long-term N addition. Nitrogen-evoked changes in plant community composition were primarily dependent on N-addition duration and functional groups. Short-term N addition favored growth of grasses, and depressed growth of forbs, while long-term N addition favored growth of sedges, and concurrently depressed growth of grasses and forbs, ultimately leading to a time-dependent shift of plant community composition from co-dominance by grasses and forbs to dominance by grasses, then to dominance by sedges. Similar to the observed aboveground biomass, short-term N addition led to an increase in the relative belowground biomass (the proportion of belowground biomass of individual plant to community belowground biomass) of the grass Stipa krylovii and a decrease in the relative belowground biomass of the forb Artemisia frigida, respectively. In contrast, long-term N addition enhanced the relative belowground biomass of the sedge Carex korshinskyi, and reduced the relative belowground biomass of the grass S. krylovii and the forb A. frigida. 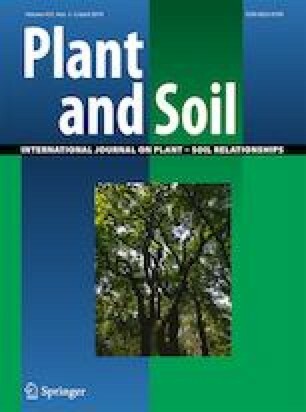 Moreover, traits of absorptive fine roots (first-two orders) in the three species (grass: S. krylovii; forb: A. frigida; sedge: C. korshinskyi) that are representatives of three functional groups differed in their responses to short-term and long-term N addition, thus rendering them differentially competitive for acquisition of belowground resource. The changes in root traits of the three species in responses to N addition of varying duration were associated with their relative aboveground biomass. Root traits play important roles in mediating the competition for belowground resource and changes in plant community composition of temperate grasslands under N enrichment. Our findings provide novel insights into N-deposition-induced changes in steppe community composition by linking root traits of functional groups and duration of N addition. Responsible Editor: Feike A. Dijkstra. The online version of this article ( https://doi.org/10.1007/s11104-019-03989-z) contains supplementary material, which is available to authorized users. We thank Weile Chen from Pennsylvania State University Michigan State University, Amandine Erktan from University of Goettingen, and Zeqing Ma from Institute of Geographic Sciences and Natural Resources Research of Chinese Academy of Sciences for thoughtful comments on earlier version of the manuscript. This work was supported by National Natural Science Foundation of China (31830011 and 31470466).